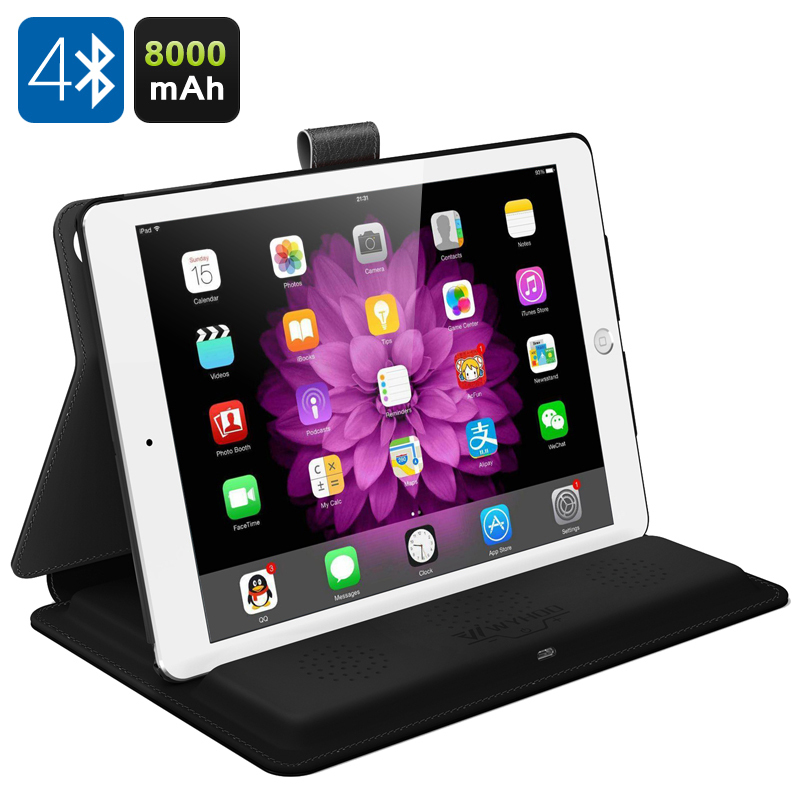 Successfully Added WYHOO 3-in-1 iPad Case - Protective case, 2 x 3W Bluetooth Speakers, 8000mAh Battery, For iPad Air, Air2 (Black) to your Shopping Cart. The Whyoo 3 in 1 iPad case brings more than just protection to your ipad Air or Air2. The Wyhoo 3 in 1 case is custom made for your iPad tablet so it fits perfectly and won’t get in the way of the buttons or camera as there are cut outs in all the correct places. This elegant case will disguise your iPad making it appear like an executive leather note book while keeping it protected from scratches and knocks. You can fold the case so as it stands upright, perfect for watching movies or when typing out an e-mail and there is a magnetic clasp to keep the case closed when in your bag or being carried around, which will ensure you screen doesn't get damaged. Two 3 watt speakers are built into the case and these can be connected with via wireless Bluetooth technology, brining great sound and up to 18 hours of play time from the 8000mAh battery. Not only that but it the built in 8000mAh battery lets it double as a power bank as well. This will let you keep your iPad powered up throughout the day and means you get plenty of extra life. This multifunctional 3 in 1 iPad Air case has everything you need to keep your tablet securely protect while enhancing its usage time and brining a louder stereo speaker for the best movies and music on the go. The WYHOO 3-in-1 iPad Air and iPad Air 2 Case comes with a 12 months warranty. Brought to you by the leader in electronic devices as well as wholesale iPad cases..